The Greenworks 18-Inch 10 Amp Corded String Trimmer is the best electric string trimmer for the value it provides. You’ve been trimming the grass and weeds in your garden with shears but it’s hard work. That’s why you want to invest in a good electric string trimmer that gets the work done fast and with ease. But there are so many choices out there and you don’t know which one to buy. No worries, because we’ll show you exactly how you can pick the best electric string trimmer you need. What is an electric string trimmer? Do you need an electric string trimmer? How to choose a good electric string trimmer? A string trimmer is a tool that can help you trim grass, small plants, and weeds. An electric string trimmer is powered by electricity. So it could be corded that needs to be plugged in a socket. Or cordless where it’s battery powered. It has a long shaft with a handle on one end and a cutting head on the other. The string trimmer uses a monofilament line instead of a blade for doing the cutting. The line will rotate fast and this rotation helps to cut the plants. You can get a string trimmer that is powered by electric or gas. The electric one could be corded or cordless. The gas powered ones are great if you want good cutting power. And they are quite mobile because you just need to fill the tank up and you’re good for a long period of trimming. The problem with a gas-powered string trimmer is the noise they produce. They need a lot more maintenance and they’re a heck of a lot expensive. The future is electric and the same holds for the string trimmer. You can get an electric one that would be as good as a gas powered one. They have the benefit of less noise so you won’t damage your ears and your neighbor’s. They’re a lot less expensive than a gas string trimmer. And they need less maintenance than the gas powered ones. You can get electric string trimmers that are corded. So you plug them into a socket and you’re good to go. Though this means they are limited in how far you can work with them. The other electric option is a cordless string trimmer that runs on battery power. This makes it more mobile when working outdoors. But it’s a little bit more expensive than the corded one. If you have a garden, you’re going to face the problem of weeds, uneven growth of grass and plants. So you’ll need some sort of trimming tool. If you have a small garden, a garden shear should be enough to get the job done. But if you’re working with a large garden, it’s good to opt for a good electric string trimmer. It can help you reach places where a shear or a lawn mower cannot. It’ll help you cut grass in hard-to-reach places like around fences, trees, and walkways. And it’ll help you edge the garden bed and bring it in shape. It’s beneficial for you if you have back issues and cannot be bending in the garden for long periods of time. There are certain features to look out for when you’re choosing an electric string trimmer to get the best value. The first thing you’ll notice about string trimmers is the shaft that connects the handle to the cutting head. This shaft could be curved or straight in design. The straight ones are best for tall users while the curved ones are better for shorter users. Because you need to trim at an angle that’s most comfortable based on your height. You can choose between a corded and cordless string trimmer. The corded ones are inexpensive and lightweight but they have limited mobility because they’re limited by the length of the power cord. The cordless ones are battery powered and have great mobility outdoors but they can be more expensive. Depending on the power source of the electric string trimmer you choose, you’ll need to check the power capacity. This could be in Amperes for the corded ones and Volts for the cordless ones. The more power you need the higher these values should be. But the price will be based on this as well. For the cordless ones, remember to check the battery capacity. You don’t want your trimming work to stop because the battery died too soon. Choose one that comes with good battery capacity. For the corded ones, it’s good to buy an outdoor extension cord that is long enough that you can trim comfortably in the yard. The cutting head is the thing you’ll find at one end of the electric string trimmer. Make sure that the area between the shaft and the trimmer has a small gap. If there’s a large one, long grass and weeds will get stuck there while trimming. Check that it’s easy to clean the head in case you want to remove debris from it. The string is attached to the trimmer cutting head and is the part that does the cutting work. You want to make sure it’s the best quality that doesn’t break or get worn out fast. Some string trimmers may have two lines that can help you cut heavier growth with ease. They might have a spool or fixed-line type of string attachment. The fixed-line helps reduce jams but needs faster replacement. It’s good if your string trimmer has an automatic feed spool so you don’t need to stop work and add more string. String trimmers come with a bump feed where you need to bump the cutting head on the ground and it automatically brings out more string. Choose a handle that is ergonomic and has a soft grip. This is especially useful if you’re going to be using the electric string trimmer often. Some string trimmers come with an adjustable handle that can be pivoted as well as adjusted for length. This is another important factor if you’re going to use the electric string trimmer often. You want it to be lightweight enough to carry around the yard without fatigue. It’s best to choose a string trimmer that has good balance as well. The ones with the motor on one end and the cutting head on the other give the best balance. We always recommend going for the best quality tools and this holds for the electric string trimmer as well. You don’t want your trimmer to die on you after a few weeks of use. Choose one that comes with the best quality and durability. The price that you pay will be worth it. The price of your electric string trimmer depends on several factors we’ve already seen. The cordless ones may cost a bit more than the corded ones. If you need one with a larger battery or more power, it’ll cost you a bit more. Quality and durability might also be factors to consider the price. You want to make sure to get the longest warranty as possible. If you’re chosen a good quality electric string trimmer, you’ll not have problems. But it’s better to be safe than sorry in case something goes wrong. Make sure that you’re not using the electric string trimmer in bad weather. You don’t want to get electrified when working in rain or when the garden is damp. Inspect the electric string trimmer and check if there is any damage. Make sure the parts are all fixed and not wobbly. Make sure to clean the trimming head from any debris that might be stuck in it. The string in the head will keep shortening over time. So ensure that the string is in working condition before using the trimmer or replace it if required. Wear a pair of thick, long pants, covered shoes, and gloves that can protect your feet and hands from any accidents. A good pair of safety goggles can help protect your eyes from debris flying during the trimming. The electric string trimmer is a great tool to trim around fences, trees, and ppes where a lawn mower can’t reach. When you’re trimming the grass, you want to keep the trimming head level and parallel to the ground. Trim the grass to the same height as you would with a lawn mower. This will help keep the cutting even on your entire lawn when you use both. The trimming head rotates in an anti-clockwise direction so you want to make sure to trim in a direction so that the trimmings fall onto the lawn. Later when you mow the lawn, it will include these trimmings as well and you don’t need to do extra work collecting them. In case the string shortens during the trimming, you can bump the trimming head on a flat surface and it should advance the line. You could even use the string trimmer to blow any trimmings from the pathways onto the lawn. Just use it in a sweeping motion over the pathways to move the trimmings. If you’re using a corded string trimmer, check if there’s any damage to the cord. If it does you’ll need to get it replaced. Check the same for the outdoor extension cord you’re using. If there’s any damage, get a new one. Check that the string trimmer is clean and does not have moisture, oil, or grease covering its surface. Before trying to use the electric string trimmer, take a look for any damage. It’s dangerous to use a damaged trimmer so either get it fixed or replaced. The trimming line or string in the trimmer may have become brittle and weak. So check if it needs a replacement. You can store the electric string trimmer in a dry location and at a height that’s safe from the reach of children and pets. The Greenworks 18-inch string trimmer is a corded one that comes with an 18-inch cutting path. It’s suitable for trimming weeds and grass in a regular yard or garden. It’s very easy to use thanks to its electric start mechanism. The cutting path is 18 inches which should help improve the speed of the trimming process. The speed of this trimmer can be adjusted with it’s variable speed trigger. The grip of the handle has a cushion and over-mold grip which makes it comfortable to hold. However, this trimmer weighs about 9.9 lbs which makes it a little bit heavy to use. The Greenworks 18-inch string trimmer comes with a four year limited warranty which is pretty good. The Black+Decker LSTE523 is a cordless string trimmer that comes with a 20V Lithium-Ion battery. This means you’ll get a decent cutting power for most of your trimming needs. It comes with a Power Drive Transmission that’ll increase the speed and improve the performance while cutting. You can control the speed of this trimmer with the 2-speed control that helps improve power or the runtime. The RPM for these speed are 5,500/7,200. The EasyFeed system of this trimmer means you don’t need to bump it on the ground to advance the line. You can do this with the push of a button. However, it’s been observed that this happens every time the trimmer is turned off and on which wastes the line. The handle is adjustable for height so you can use it comfortably. It weighs 6.3 lbs which makes it lightweight enough to carry around in the yard without discomfort. The Black+Decker LSTE523 string trimmer comes with a 2 year limited warranty that should be sufficient. 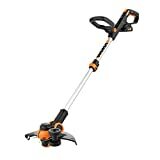 The WORX WG163 is a cordless grass trimmer that comes with a 20V Lithium-Ion battery sufficient for your everyday trimming needs. 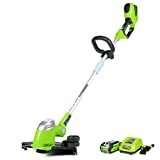 This string trimmer has a 12-inch cutting diameter that should give you a good cutting performance for grass trimming and edging. It comes with a single-line feed that does not need bumping on the ground to extend it. The spool is a little bit small though and you’ll need to change the spool often as it gets used. The handle comes with a quick-release lever that helps you adjust the height for a comfortable trimming experience. It comes with a flower spacer guard that helps protect your plants and helps when edging the garden beds. 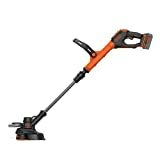 The WORX WG163 weighs just 5.3 pounds which makes it a pretty lightweight trimmer comfortable to use in your yard. This electric string trimmer comes with a limited three-year warranty against manufacturing defects. 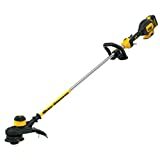 The DEWALT DCST920P1 is a cordless string trimmer that comes with a 20V Lithium-Ion battery sufficient for your trimming needs. It boasts of a brushless motor which means you get better trimming efficiency and your trimmer lasts longer. The 13-inch cutting diameter of this trimmer should give you sufficient power for cutting tall weeds and grass. The trimmer comes with a bump feed which means you should be able to extend the line by bumping it on solid ground. The patented gear design and 2-speed control helps you get speeds of 4,600/6,000 RPM. The DEWALT DCST920P1 comes with a limited three year warranty which should be good enough in case something goes wrong with the tool. The trimmer weighs about 8.5 lbs which means it’s a bit heavy but decent enough to carry around in the yard. This string trimmer is pretty expensive considering some of the other options available. The quality of the tool is good but you need to decide whether the price is worth paying. The Greenworks 13-inch cordless string trimmer comes with a 40V battery that will give you up to 60 minutes of cutting power. It’s easy to start using this string trimmer as it starts at the push of a button and can reach speeds of 9000 RPM. This gives you a good cutting performance. The trimming head can pivot into 4 positions which gives you the choice of edging and trimming in your garden. 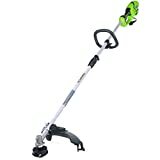 The Greenworks 13-inch trimmer weighs about 9.26 lbs which makes it pretty heavy to carry around in the yard. This trimmer comes with an auto line feed which means you don’t need to worry about bumping the cutting head on the ground. You should be able to bring out the required line with the push of a button. Though customers have mentioned that it does not work very well. So you may need to manually advance the line feed instead. We think the Greenworks 18-Inch 10 Amp Corded String Trimmer is the best electric string trimmer you can buy. It’s inexpensive but gives a good cutting performance and durability that you want. It’s a bit heavy but comfortable to use thanks to it’s cushioned and molded grip. And it comes with a four year limited warranty that should be useful.